In this second post in our series Inspired Giving, you’ll hear from three Quilt Alliance board members who have both donated quilts to our annual auction and purchased quilts for their personal collection made by other artists. Allie Aller, Meg Cox and Lisa Ellis have each donated multiple quilts to the Quilt Alliance’s annual contest, exhibition and auction. We asked each of them to tell us more about their personal quilting history, and what inspires them to create, donate and collect quilt pieces. 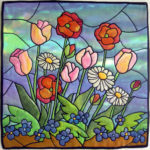 You can bid on the current group of Quilt Alliance auction quilts here. Tell us your name, location and occupation. 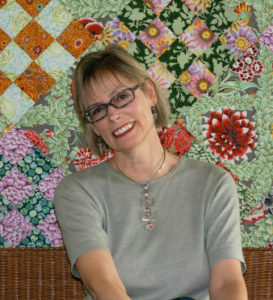 Allie Aller of Washougal, WA, studio quilter, author, teacher. 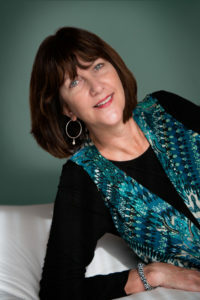 Meg Cox of Princeton, NJ, journalist. 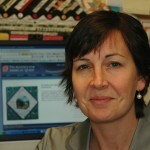 Lisa Ellis of Fairfax, VA, currently working part time as both an Engineer and Quilt Teacher. Both offer fulfillment. One pays the bills. How many years have you been quilting and who taught you to quilt? Lisa: 13 years quilting; taught by a friend from church, Gwen Emmett. Since she graciously taught me in her home, I have paid it forward and done the same for others. Where do you quilt and what themes or techniques are you currently working with in your studio? Allie: I quilt in my own sewing room at home. I’ve been intently exploring new approaches to stained glass quilting, after having spent several years pursuing the subject in the 1990s. I have a new book coming about this work in February 2017, Allie Aller’s Stained Glass Quilts Reimagined: Fresh Techniques and Design, from C & T Publishing. LIsa: I quilt in my home studio. I have spilled out into what used to be our formal living room. I am currently working on a series based on the cathedral window. I am using the circular motif to pixelate images. The folds in the block add texture and depth to the design. What do you include on the labels of the quilts you donate? Allie: Quilt title, my name, where it was made, the month and year. If it is specifically for some one, I will write a personal inscription. Lisa: I always include my name, location, and the date. 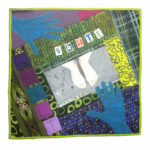 What inspires you to make and donate your quilts to the Quilt Alliance contest and auction? Allie: I believe in the Quilt Alliance’s mission, and want to support it. Also, I love being part of each group of contest quilts, because they are so diverse and as a whole make such a rich impact together. Finally, the design challenges for each theme every year are fun and inspire me to try new ideas. Meg: I love making quilts for Alliance contests because they challenge me to try new techniques and styles, and I know that they’ll be archived online permanently in the amazing Quilt Index (which makes it easier to give them away to strangers). Lisa: I wish to support an organization whose mission I believe in. I have always been drawn to the stories expressed in quilts. 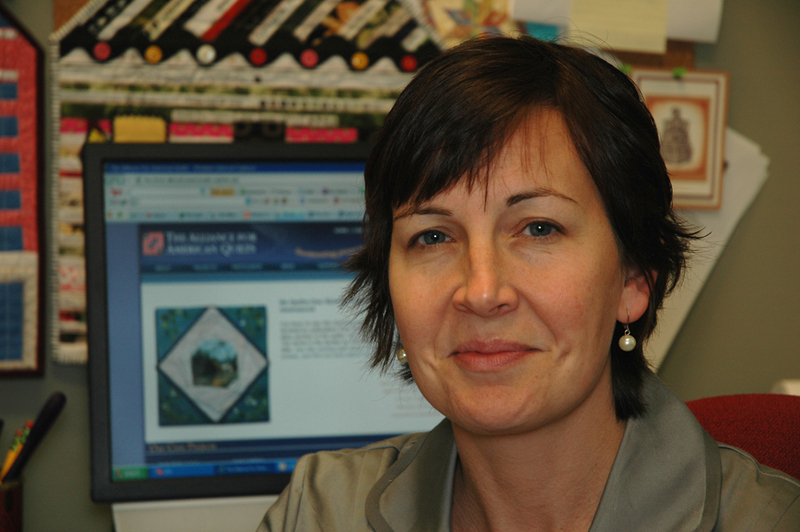 The Quilt Alliance mission to capture these stories in perpetuity is important to me. 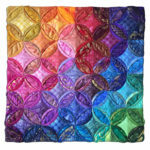 As a collector, what motivates you to buy a quilt? Allie: If I really love it and am inspired by it and want to live with it! 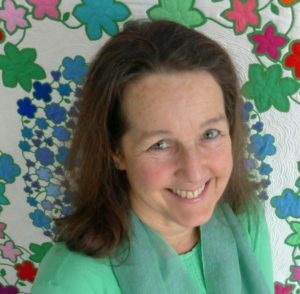 Lisa: I love to decorate my spaces with quilts and appreciate being surrounded by artwork created by other artists. Their ideas and creativity inspire me. Thank you, Allie, Meg and Lisa, for sharing your quilt story and for donating many gorgeous quilts to our annual auction! Bid on the 2016 “Playing Favorites” quilts in our online silent auction, now through Monday, December 5 at 9pm EST on www.BenefitBidding.com/quiltalliance.